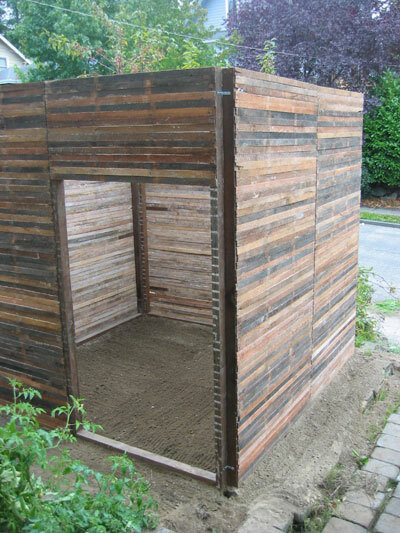 Temporary shelter made from salvaged wood studs, wood sheathing boards, and wood doors. Status: built and dismantled in September 2018. As the end of each summer nears, I begin scouting for salvage material sources. 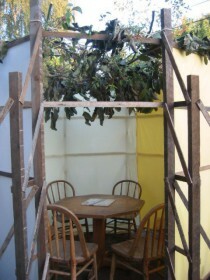 This year’s sukkah was born from the promise of old fir lumber and an assortment of doors. I was intrigued by dynamic doors opening to reveal the outside world or closing to create privacy. 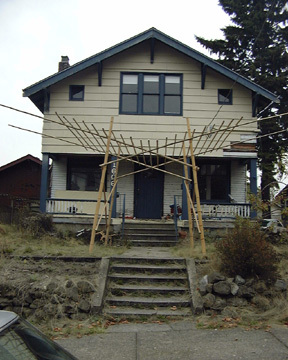 A client’s brother was demolishing the second floor of an old house. I took studs from interior partition walls, boards from exterior sheathing, oak flooring strips, and a trio of interior doors from the family’s bedrooms. Careful deconstruction required four hard days to remove dozens of nails without damaging the wood. Brutal demolition would have been much easier, but not yielded usable material. 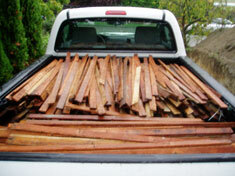 Truck rental cost $25 and screws cost $80, but the lumber was free. The doors were both the inspiration for the design and the determinant of the dimensional layout. I spent a full day chopping 28 studs, 28 plates, 22 stops, and 121 boards to identical lengths. I needed a second full day to assemble these components into 14 matching panels using 150 long screws and 400 short screws. Finally I took a morning to raise and plumb the panels and screw each to its neighbor to create the walls of the enclosure. 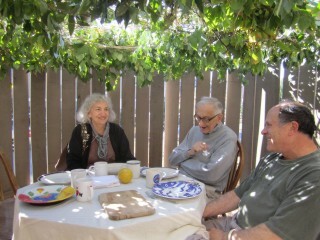 We enjoyed glorious autumn weather all week, with just a hint of rain at our final meal. 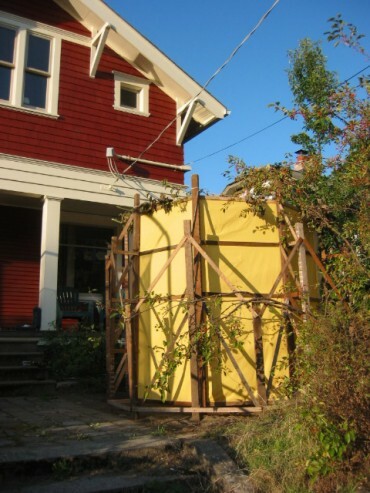 At the end of the holiday week, the structure was disassembled into its 14 panels, and re-erected in a friend’s back yard to serve as a hot tub enclosure. Temporary shelter made from salvaged steel roofing, steel purlins, and acrylic panels. Status: built and dismantled in October 2017. Doodling ideas for this year's sukkah design, I was inspired by the magnificent Air Force Academy Chapel. The canted walls soar skyward, colored acrylic panels create a "stained glass" window for the west wall, and the plant cuttings appear to hover above the table. Some clients were demolishing the roof of their garage which provided the source for this year's salvage materials. This was the first year working mostly with steel material. Because steel is so strong, the frame members could be thin and elegant. 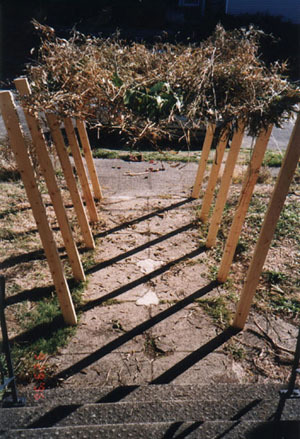 Pairs of screws at each joint were sufficiently rigid that this sukkah did not need diagonal bracing to remain stable. 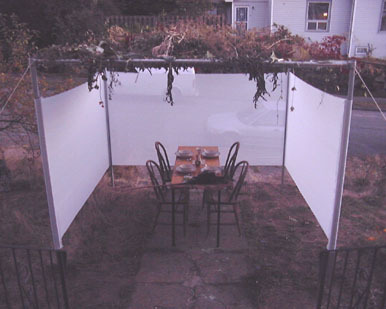 The dimensions of this sukkah are based on the exact sizes of the materials inherited and the available footprint of our front yard. The steel frame members are 122" long, the siding is 104" tall which is exactly half of the inherited roofing panels, the width of the footprint is 8' by 9' to fit our yard, and the width at the top exactly fits two 19" by 36" acrylic panels. Working within these constraints, I used my eye for proportion and scale to determine the overall size and layout. At the end of the holiday week, the structure was dismantled, the screws were saved for future projects, and the steel frame and steel roofing were recycled. The colorful acrylic panels were left over from a student art class and are as good as new, ready to be reused again. Temporary shelter made from salvaged chimney bricks. Status: built and dismantled in September and October 2015. We converted our furnace to a gas condensing type and replaced our water heater with an electric heat pump. That meant our utility chimney was no longer needed to exhaust flue gases. 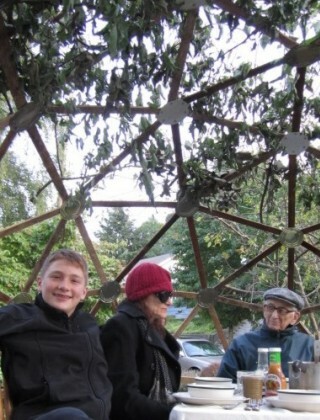 So after 105 years of service, we dismantled it and used the bricks for this year's sukkah. It took an entire day with a hammer and cold chisel to chip off the old limestone mortar. Fortunately it was aged and crumbled fairly easily. The bricks themselves were in fairly good condition. They were Duwamish bricks, dug from the mud of Seattle's principal river and fired at fairly low temperature. Because they were intended for a utilitarian chimney, they were neither flat faced nor of uniform dimension. The chimney yielded about 600 bricks. That was just enough to build a 6 foot diameter circle almost 6 feet high. Spacing the bricks was a necessity to make that quantity extend that diameter and height. The spaces created a wonderful closed yet open effect when viewed from the inside. The weather was marginal and our schedule was hectic, so we really only enjoyed one lovely warm evening of convivial conversation with eight of us circled cozily around the table just inside the brick enclosure. At the end of the holiday, the bricks were taken to Portland, Oregon of all places to have a third life as the footpath for a church. Temporary shelter made from discarded furniture. 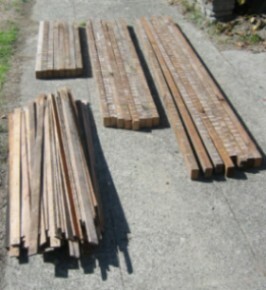 Source of building materials, free ! 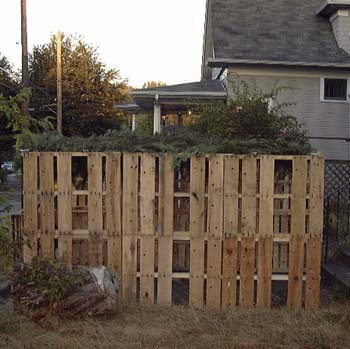 For this year's sukkah I turned to an abundant source of salvaged materials: the curbsides in my neighborhood. Every piece of furniture was collected within a 1/2 mile by 1 mile area, over a 3 week period in August 2013 (see red dots in map above). 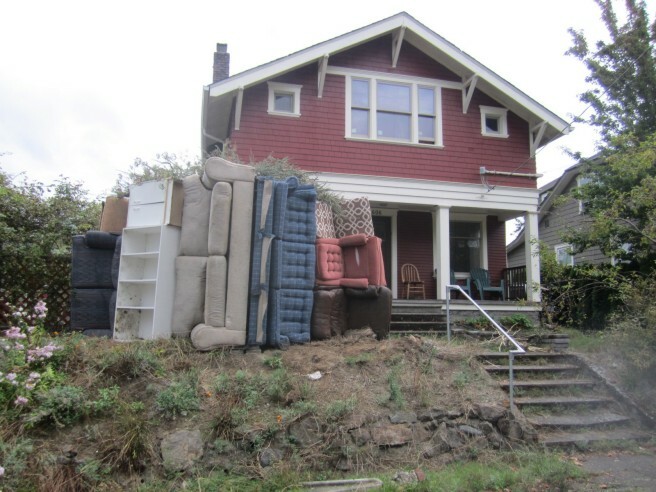 When you consider that my collection area is but a fragment of my city, which in turn is a minuscule bit of our country, it boggles the mind to consider how much unwanted junk furniture gets discarded in the USA. And junk it was. 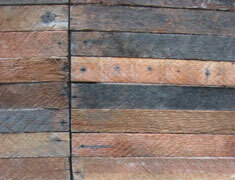 The cheap materials and shoddy construction of every piece destined them for the landfill from the day each was made. Only quality furniture of enduring value enjoys a long life in antique shops and people's homes. 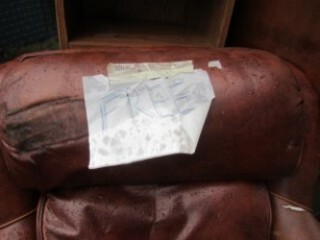 Ironically, my collection of "free" furniture cost a whopping $140 to discard at the landfill plus $60 to rent the truck to haul it there. No wonder people leave this useless stuff on the sidewalk! 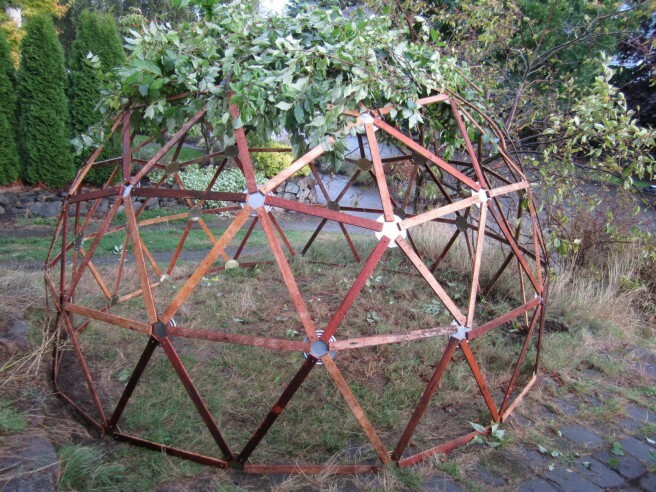 For the roof, bamboo struts support a salvaged rattan chair dome in the center. The branches cast an intricate shadow pattern on the insides of the stacked furniture. Each couch stands on its own, and the stacked chairs are surprisingly stable. The weather was glorious all week long, except for one memorable evening when a rogue shower drenched us in minutes. 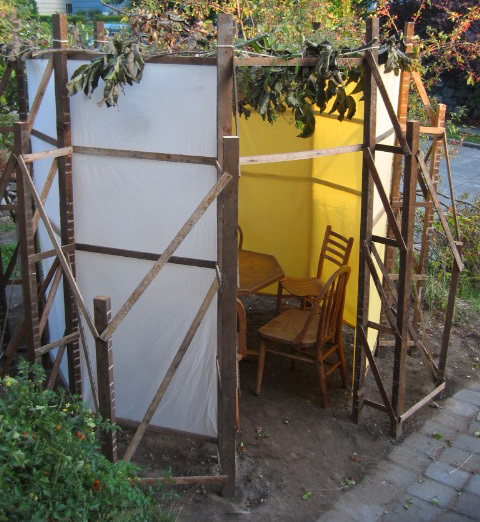 Temporary shelter made from salvaged plastic lumber. 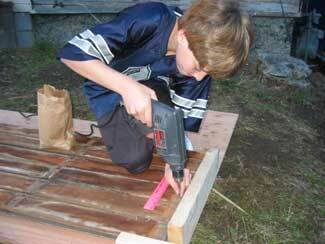 The demolition of a nearby deck provided the raw material for our sukkah this year, for no cost (screws cost $10). 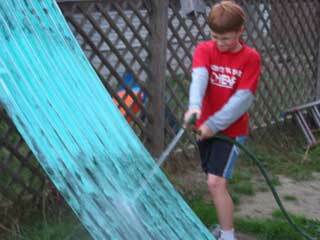 The boards are HDPE plastic, themselves made from 100% recycled milk jugs. They have more flex than wood boards, so I decided to form a curved wall instead of squared walls. 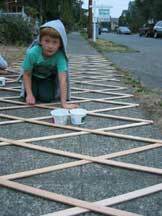 The boards were used in the lengths we got them, which is about six feet. As in the source deck, the boards were installed with gaps between to simplify the joinery and to admit a restricted view and daylight through the walls. Every fourth board is set to the interior to give the wall surface some rhythm. At the doorway I simply left out a few boards. 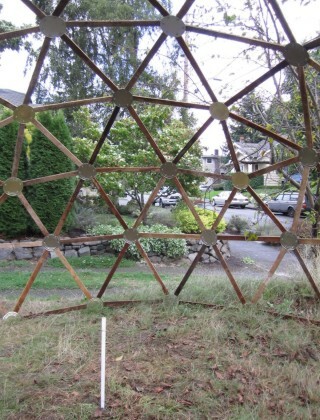 For the roof, jute twine was woven in a Spirograph pattern to leave an oculus opening in the center. The criss crossing twine provides support for the branches everywhere else except for the center hole. The weather was warm during the day and chilly but clear at night. 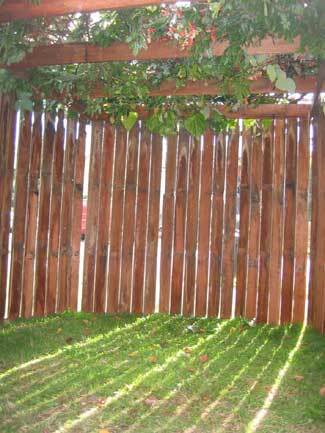 Another Sukkot without rain. This design was both roomy enough to be comfortable and sufficiently enclosed to feel private and cozy. At the end of the week, the boards were sold through Craig's List and went on to become somebody else's new (salvaged) decking. Temporary shelter made from salvaged lumber scraps, salvaged wood door frame, and salvaged corrugated plastic patio cover. 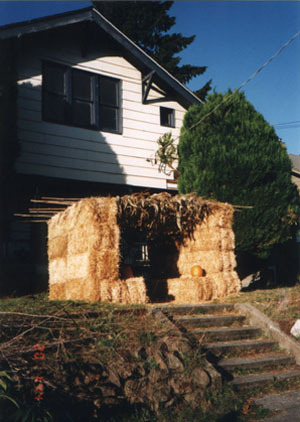 A nearby demolition provided the materials for our sukkah this year. 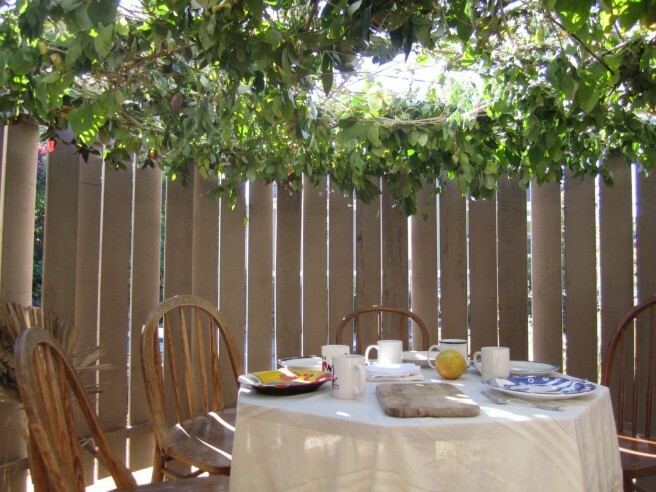 The patio cover panels worked great for the walls, but they were too ugly to be left unadorned. So, we decided on a grunge twist this year with graffiti thematic for the holiday. The kids' reaction was predictable: "Sweet! That is totally rad!" (teenage speak for "we like that idea, Dad"). 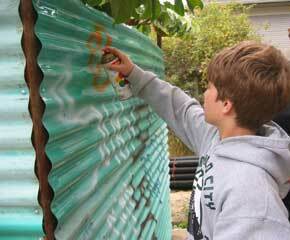 A friend donated nearly spent cans of old spray paint, so we did not have to feel guilty about buying toxic chemicals. The weather was cold but clear, except for one day of rain. 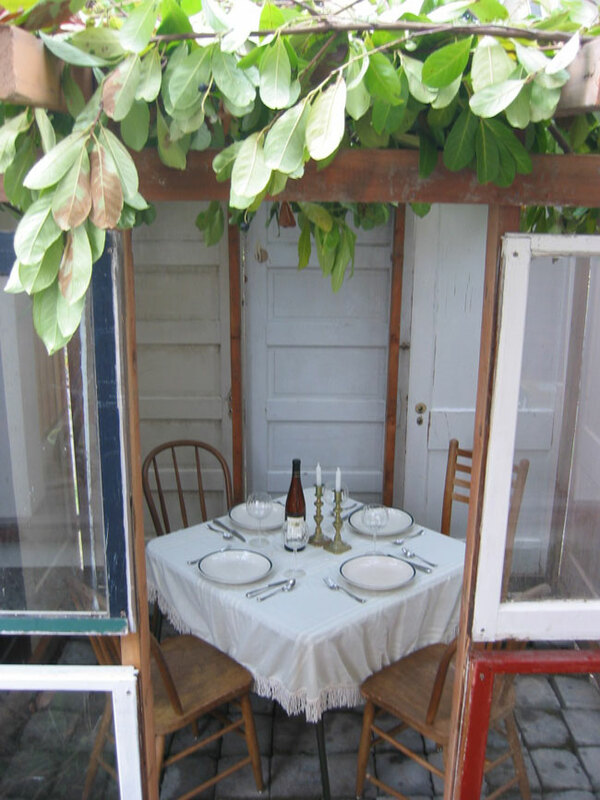 This sukkah was taller than we usually build, and the interior had no feeling of intimacy at all. The exterior drew not a single comment from the neighbors, but by now they are convinced that we are completely crazy. Materials cost nothing and construction took one day. 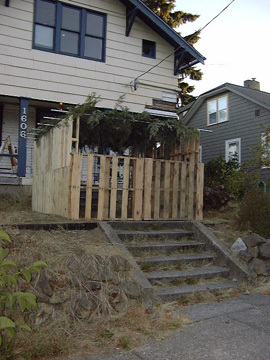 The sukkah was dismantled at the end of the holiday week and the materials were returned to the dumpster for eventual disposal in a landfill. Temporary shelter made from new steel poles and new scrim cloth. 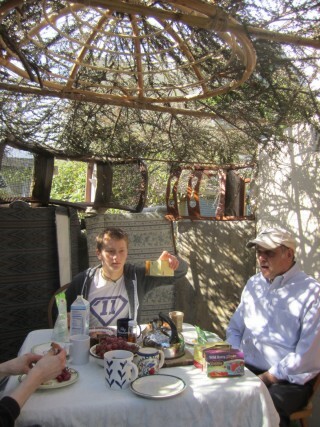 This sukkah exploited the fact that we dine in it at night by candlelight. The fabric "walls" are made of $30 worth of theater scrim, which is opaque to a viewer on the side that is lit, but transparent to someone on the dark side. All day, the interior is obscured to passersby. But at dusk, when we light candles inside, the interior glows and our dinner party is visible within. Additionally, like a shadow theater, the candle flames cast our shadows onto the fabric, where they created moving images for viewers on the outside. Unfortunately, there is no way to photograph this effect. For the covering, thanks to the University of Washington's botanical greenhouse for offering their rare and exotic brush pile. The frame is made of standard chain link fencing poles and connectors, which cost about $60. Construction took one day. 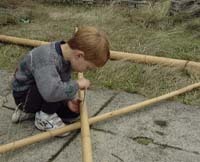 The sukkah was dismantled at the end of the holiday week and the poles were saved for future use.